QuickPhase Pro is a full-featured, beautiful moon software program for Windows and Mac desktop computers. Thousands of people from around the world have used the software on Windows for over 12 years. Just recently we completed a new, more advanced version that works on both Mac and Windows. Fishermen, hunters, gardeners, hikers, photographers, teachers, researchers, psychologists, New Age enthusiasts, paranormal investigators, astrologers, astronomers, dieters and many others have all enjoyed having the software at their fingertips. 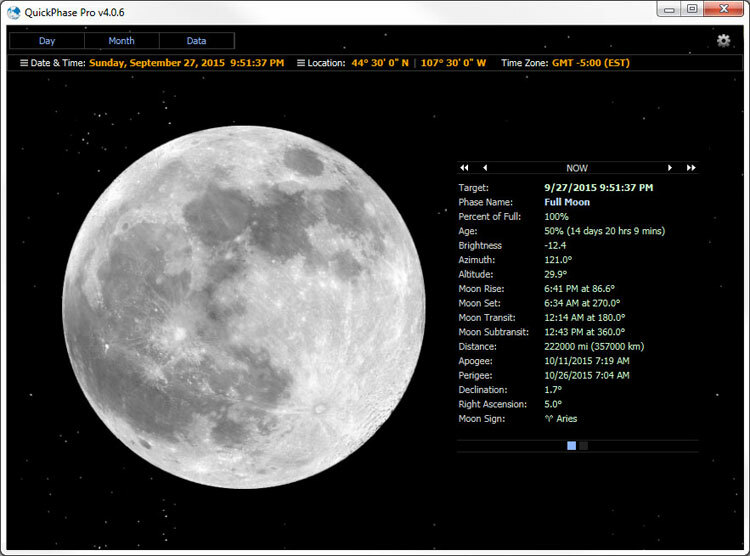 QuickPhase Pro provides quick moon data for current, past and future dates and times. Data includes phase, age, percentage, position details, rise/set ... new, full, first and last quarter moon times ... sunrise/set information ... data exporting ... and more. You can enter a precise instance and the program will calculate moon and sun data for you. It also provides a moon calendar. If you have an iPhone or Android computer and are looking for a mobile app, take a look at Luna Solaria.